What are the challenges when translating complexity into simplicity – and how do we measure success in such an endeavor? 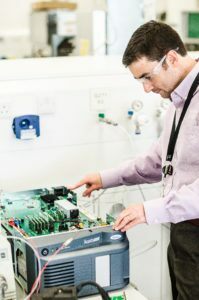 Daniel Kenny, Director of MS Development at Waters, shares the motivation, inspiration and celebration behind the development of the ACQUITY QDa Detector. What was the starting point for the ACQUITY QDa Detector? We believe in the power of mass spectrometry – what it can do and what it can deliver. So we started by considering what barriers were preventing people from adopting MS technology – affordability and footprint came into play, but the big focus was on the question: “Why is mass spectrometry seen as being scary?” We knew that we needed to address the complexity behind mass spectrometry for our customers, which is why accessibility and usability are integral to the design of the ACQUITY QDa. Most people will be aware of “triple constraint” triangles – but we were working with a square, needing to balance usability/robustness, miniaturization, cost, and also performance. For example, with the source, instead of trying to achieve ultimate performance for any one compound or any one assay, we focused on ensuring good quality data for most analyses, most of the time by simplifying the design. Minimizing the degree of compromise on any one corner of our square required serious innovation. Is that why the concept-to-product timeline was longer than usual? The ACQUITY QDa is an absolute ground-up redesign of a mass spectrometer. Typically, new instruments come about through evolution – borrowing several components from an existing product while introducing a new innovation that boosts sensitivity, for example. You don’t normally have to reinvent absolutely everything for a new instrument – especially when you already have components that are fit for purpose. However, this was not the case with the QDa. I believe it was over four years from first informal discussions to finally putting the instrument in our customers’ hands. Within that time, the engineering model phase was essential, allowing us to make – and learn – from mistakes as we focused on miniaturizing and simplifying various aspects of the evolving design. A prototype of the ACQUITY QDA detector. Could you share some examples of “ground-up” design in the QDa? We filed numerous patent applications for inventions related to the ACQUITY QDa – and not the sort of patents that we have historically filed (which tend to be focused on performance – new ways of manipulating ions, getting more sensitivity, and so on). A good example is the electrospray probe – something that a user will almost certainly have to interact with at some point, because the capillaries within can become blocked or deteriorate over time. We wanted to make maintenance as painless as possible (it takes quite a bit of a skill to dismantle a typical probe and fit a new capillary) and that led to a very different probe design. The probe is an all-in-one component, with the capillary already crimped to the PEEK tube that will connect to the column or UV detector. You can literally swap the whole probe in a matter of seconds rather than taking up to an hour to do so. And, perhaps more importantly, the process is more reproducible, which ensures consistent performance that does not rely upon on user aptitude. An all-in-one design also allows us to minimize dead volume – another benefit to the user. Another aspect of usability is robustness. 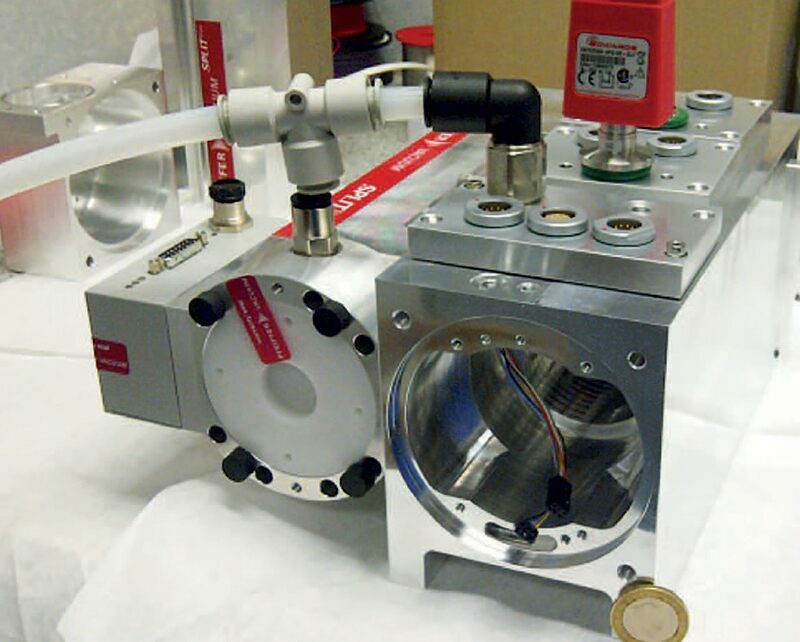 We’ve built the QDa detector as something that is going to be used day in, day out – perhaps by someone who may not have worked with mass spectrometry before. To that end, we assumed that users were either not accustomed to – or simply did not enjoy – cleaning the sampling orifice or cone as they would have to do in a typical electrospray MS system. The evolution of the ACQUITY QDa’s reverse cone geometry. So instead of having a very small sampling aperture at the apex of the sample cone, we decided to hide the aperture down a tunnel that protects it from spray that would lead to charging problems over time. And with cost also in mind, we engineered a solution that was inexpensive and so easy to replace that a novice can do it with confidence. The component is effectively disposable; when it becomes dirty or blocked, you vent the instrument, throw the orifice in the trash and insert a new one. And because the pumping volume of the ACQUITY QDa is very small, you can be up and running again in another ten minutes. Going back to the electrospray source, in traditional mass spectrometry we have almost infinite flexibility – we can move the probe up and down, left and right, we can move the capillary within the probe, we can change the gas flow, the temperature, entrance voltages. All the variables allow us to optimize performance for a given analytical need – but they also add a great degree of complexity. In the ACQUITY QDa, we reduced complexity (and therefore flexibility) by designing a completely pre-optimized geometry with fixed gas flows and so on. The result: it just works. Many other engineering solutions and innovations came into play during development to bring the push-button simplicity and footprint of the QDa Detector. Clearly, there was a lot of hardware innovation – what about software? We applied the same rules to the software – we wanted to maximize usability and create something that will be familiar to chromatographers. To that end we locked down certain parameters and automated complex tasks. But there’s a lot going on behind the scenes, with many advanced (but little-used) settings hidden from view and set to optimal defaults. We also looked very closely at the software interfaces we had in place for other LC detectors, and tried as best we could to use the same language and terminology. We wanted interaction with the ACQUITY QDa to be highly familiar with chromatographers coming from a UV or PDA detector background. Was everyone involved as passionate about the project as you? It was one of those great times when we had great deal of buy in – everybody understood the concept and was fully focused on delivering it. It really was a massive team effort – it took the efforts of hundreds of people to make the ACQUITY QDa happen. Without the passion and determination, I don’t think we could have achieved what we set out to do: create an extremely user-friendly mass detector with appropriate performance at the right cost – and in a format that fits into a regular HPLC stack. Why has it taken so long for a mass detector like the ACQUITY QDa? I suspect there have been several attempts before – but they probably strayed away from the original concept and core objective. Sometimes it seems safer to hedge your bets and end up with a product that is too far removed from the initial remit. We were brave enough to maintain the clarity around our original vision right through to production – and I guess that’s quite unusual in a performance-obsessed industry. By choosing instead to focus on ease of use, size and cost – and accepting that some customers don’t need the highest levels of sensitivity or the widest possible mass range – we’ve found success where others have failed, by opening up mass detection to a new audience. The development of the ACQUITY QDa – and the response that it’s received (both internally and externally) – has emboldened us; we now realize that ultimate usability is something that is truly valued. We’ve recognized that we can successfully move in a new direction of innovation and I am sure that will be reflected in products that we commercialize in the future. Waters has always driven by performance (and we see ourselves as ahead of the technology curve in the marketplace) – now, we will also be driven by the need to provide a well-rounded experience for our customers. The ACQUITY QDa is actually our fastest-selling mass spectrometry product – but many users will simply see it as just another detector, which I think is fantastic. It means we’ve succeeded! We never wanted to supplant UV detection, which is still a gold standard for many things, rather we wanted to supplement UV with additional valuable information that was previously out of reach. Witnessing the uptake of QDa, and seeing customers benefit from what we have achieved is immensely satisfying. Disruptive products tend to spur surprise applications – has anything caught your eye? In the beginning and through development, we were aiming the ACQUITY QDa squarely at (liquid) chromatographers – and so yes, some applications have been unexpected and also very interesting. For example, we’ve heard of QDa detectors being wheeled around on laboratory trolleys to take the analysis to the sample – others are being used in fume-hoods to monitor reactions. And we literally put one into a rucksack and carried it to the top of a mountain to do analysis with a special prototype probe. Many of these exciting applications are point-of- use direct analyses that simply take advantage of being able to do something new. And that’s perhaps more satisfying than anything else. This content was originally produced and published by The Analytical Scientist for Waters: Mass Data Made Simple.